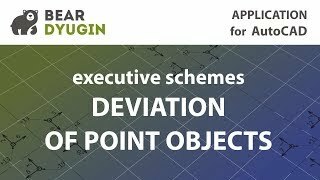 The application creates arrows with signatures of deviations from the project in the plan, as well as the callouts with the value of the deviation from the altitude. The block is reversed relative to the insertion points at short distances by the application. The block is moved and the callout from the starting point of the insert is built at long distances by the application. The application is similar to the [Geo_dev_vertical_sel]. There is only one difference that in this case only blocks, that contain deviation values large, then the allowed values, will be selected. The application creates dimensions that contain 2 values: the first one is project value (from axis to construction) and the second one is actual value (from axis to point). Since the application creates large number of different blocks, it is convenient to use this command for their mass selection. The application adds to the already existing dimensions the actual distance calculated by the points found near the base points of the dimension. In this case, at least one point of the actual point is sufficient. 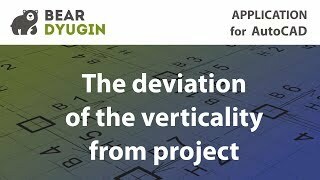 The application is similar to Geo_dev_dist_ax-co-pt, with only one difference being that 2 dimensions are supplied from one corner of the structure to 2 perpendicular axes, containing the project and actual values. Since the application creates a large number of different blocks, it is convenient to use this command for their mass selection. 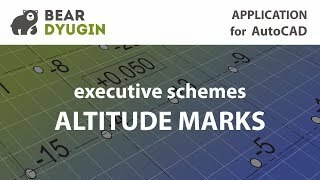 The application makes the high-altitude deviations on the plan. The application creates arrows in the drawing with signatures of deviations from the project. 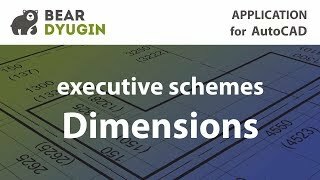 The application allows you to select dimensions that contain values that are large, then the allowed values. The command replaces values that exceed permissible values by values equal to the tolerance, while changing the color as for normal values. Replaces all values that exceed tolerance, by good values.